Of Gingrich, Don King, and the meaning of MLK Day | Jon Katz, P.C. Tomorrow will be the sixth presidential inauguration since I landed in Washington, D.C., for law school in 1986. I stayed away from Bush I and II’s inaugurations, vehemently opposed to both. I worked through Clinton’s two inaugurations rather than attending, non-plussed that much by the man, except for being happy for seeing Bush I gone. I do not hold open the likelihood that Obama will deliver better performance than Bill Clinton, at least not for criminal defendants. I foresee him perpetuating the draconian federal prosecutorial system that puts so many unjustly behind bars for too long, where the criminal justice system would be more fair, more accurate and much less expensive if marijuana were legalized, all other drugs were heavily decriminalized, and if mandatory minimum sentences were eliminated. – The weekend started in bizarre fashion, when I spotted Newt Gingrich on Saturday afternoon at the Tysons II shopping mall in McLean Virginia, at first fading into the woodwork in a sportsteam jacket. I decided not to say anything to him, figuring that he is not in a position to harm anyone any longer. – On Saturday night, I attended an inauguration party that to my pleasure had more the hallmarks of a tightly-packed, music-too-loud, alcohol and soft drinks overwhelming snacks party reminiscent of many held by students at my college, except that most people were wearing evening or business clothes. This was at a group house in Washington, D.C., and I was invited by a great civil libertarian whose daily job is in that arena, and who sympathized with my approach that I was coming for the people there — including fellow civil liberties activists — rather than for Obama. The party got so crowded and loud that I returned home after an hour. – On Sunday afternoon, my wife, son and I took the subway to the Farragut West stop, to experience the Inaugural concert at the Lincoln Memorial, which is where Martin Luther King, Jr., delivered his “I Have a Dream” speech in 1963. We made the decision at the spur of the moment, so arrived too late to be permitted into the fenced-in area. On our way from the subway station, we saw not only cops keeping roads closed to vehicles, but soldiers in fatigues standing next to military vehicles. I was not about to tell my son that I was leaving so as to avoid the discomfort of this martial presentation, although I appreciate that no firearms other than handguns were displayed. As we got to Constitution Avenue near 18th Street, N.W., we heard U2 playing “In the Name of Love”. It was a rush to hear U2 again and at this time. At the conclusion of the event, Obama spoke. As much as I do not hold open hope that Obama will do any better than Bill Clinton when it comes to criminal defendants, during his speech, I felt an energy in the crowd about the end of a dark era during Bush II’s time in the White House, and the beginning of possibilities to reverse the devastated economy, switch courses in Iraq and Guantanamo (but Obama has stated a dedication to reinforce fighting power in Afghanistan), and smash racism by tremendous leaps. 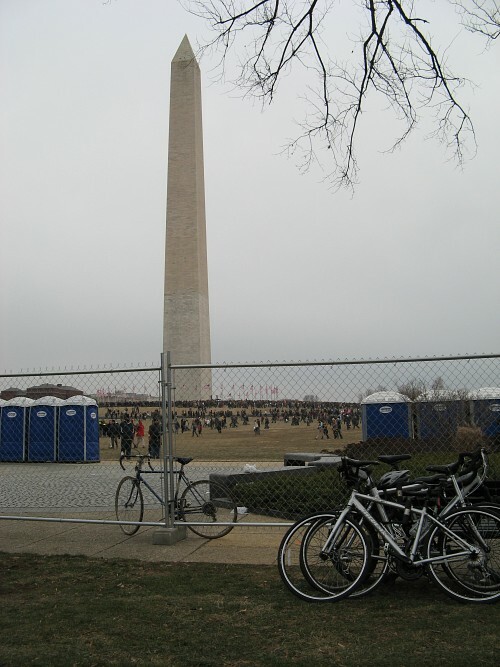 Here is a photo near the Washington Monument near the end of the concert. We let the huge exiting crowds for the subway die down by walking to a nearby hotel for a snack, where the highlight was seeing Don King, happily obliging those enjoying his presence and asking for photos with him. – On Monday, I drove to the D.C. Superior Court for a client’s bond hearing. The police had several streets closed east of Fifth Street, N.W., north of the courthouse, and south of Chinatown. Nothing else seemed unusual about the area other than extra police presence and signs for cars to vamoose by 3:00 p.m. from street parking, plus several soldiers in fatigues around one mile up the street in front of a major AIDS/HIV campaign. – At lunchtime, I drove to the D.C. temple of the peace-promoting Nipponzan Myohoji Buddhists, a few miles up the street from the White House. In addition to the local nun, two nuns and two monks were in town from Massachusetts and upstate New York to pray for peace during the inauguration. In the early morning today, they will walk and drum for peace to the swearing-in site/Capitol building several miles away. The Nipponzan Myohoji nuns and monks inspire me to stay on a peaceful path while remaining aggressive in fighting for justice. When I arrived, a motorcycle cop was nearby, waiting for Obama’s return to D.C. from visiting the nearby Walter Reed military hospital, Obama had the opportunity to see the temple’s huge prayer for peace, on gravestone material, both on the way to and back from Walter Reed. On Obama’s way back, several protesters who have been liquid-fasting for nine days demanding Guantanamo’s immediate closure were already waiting for Obama with demonstration signs. 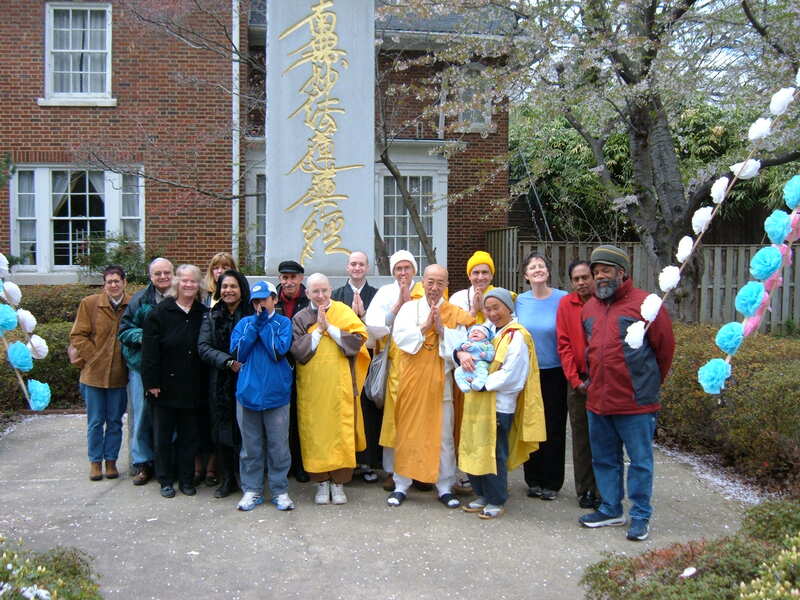 – On Monday evening, I followed the Nipponzan Myohoji folks to the packed “Rebirthing King, Rebirthing America” program at the All Souls Unitarian church down the street. presented by the Olive Branch Interfaith Peace Partnership. McCain supporters probably would not have been comfortable in the room. The mood was not one of swallowing Obama’s actions hook, line and sinker, but to see the possibilities of motivating him to do the right thing, to a point. Among those in the audience, once again, were the demonstrators demanding Guantanamo’s immediate closure. The fight for social justice must continue.